The JA New York Business Plan Competition (BPC) is an intensive entrepreneurship education experience for high school students. Since its inception in 2008, over 7,500 high school students have received valuable business and entrepreneurship education. Students work in small teams to create a viable business plan for a product or service. Click here to read about the 2018 BPC winners. Several rounds of online and live competition determine the top three teams to receive cash prize awards and a trophy for their school. First, second, and third place prizes totaling nearly $220,000 since the program's inception have been awarded to competitors who presented the strongest, most creative, and innovative business plans. Past participants have gone on to create successful business enterprises of their own. How Do Students and Volunteers Benefit From Participation? Business Plan Competition students learn key business concepts and skills while developing a blueprint strategy to launch a new product or service. The unique curriculum helps students get excited about the world of business and entrepreneurship and empowers them to use entrepreneurial thinking to create value, in their own companies or working for someone else. The small group sessions with "real world" business volunteers personalize the student experience. Volunteers benefit from mentoring the students over the course of two months as they deepen their connection with the teams. Their professional experiences and insights help students learn what it takes to work collaboratively with a team to create a successful business. Educators: Due to high demand, this program is only open to select JA New York partner schools. To learn more about how you can work with JA New York, please click here to learn more about how we partner with schools. Please note that the Business Plan Competition is a very intensive program and that students will need access to computers/Internet at least once per week, as well as class time outside of the volunteer visits. Volunteers: Interested in coaching students? JA New York will provide all curriculum, training, and support for your commitment. The program requires six 45-minute sessions with your assigned BPC class. To ensure a high level of support for students, we aim for 2-3 volunteers per class. If you would like to partner with friends or colleagues, please let us know – otherwise, we may place you with other volunteers. The program is made possible by generous support from: Presenting Sponsor, ICE NYSE Foundation; Major Partner Sponsor, Delta Air Lines; Founding Partner Sponsor, G.C. Andersen Partners, LLC; and In-kind Partners, EY LLP and The Bernstein Center at Columbia Business School. Sponsorships for these events are critical for Junior Achievement to continue providing life-changing programs to students in our community. These programs are delivered at no cost to students. You can make a difference in the lives of these students by participating in this world-class event! Contact us to get more information on how to become a sponsor. On Thursday, May 31, 2018, aspiring young entrepreneurs Dvir Avnon-Klein, Seungwon (Leo) Hyun and James Snyder from Bronx High School of Science led their team and school to first place victory in the final round of Junior Achievement of New York's 11th Annual High School Business Plan Competition. Their proposed idea for a cell phone-based biosensor that detects contaminants in meat – MeatMate – would allow consumers to cheaply and quickly screen meat samples using a portable cell phone attachment device. MeatMate stood out from the six other finalists' ideas centered on this year's theme, The Next Big Thing: Products. Utilizing new sensor technology like mobile raman and reflectance spectroscopy, MeatMate would be capable of screening meat samples both through direct exposure and through clear packaging materials. This would allow consumers to process the information about possible contaminants before committing to the purchase of the meat. Members of the team each received a cash prize of $2,500 and a trophy for their school. In the eleven years since the program's inception, competing teams from Bronx High School of Science have won first place three times, and have placed 1st, 2nd or 3rd place seven times. During the concluding round of an intensive four-month business education program and competition, seven finalist teams presented their proposals for innovative products and services that fill a market need to a panel of high profile business judges at the all-day event held at EY's offices in Times Square. Each team made it through the final round after rising to the top of a competitive pool of 180 teams (comprised of nearly 700 students) following a series of knock-out preliminary rounds. Team Wizzle's Kayleen Pena, Endi Trimi and Larissa Richard and Amanda Ozman from Leadership and Public Service High School in Manhattan each received $1,500 each as the second place team. Wizzle is a smart 3D printed whistle that can go up to 120 dB, drawing attention to those who require assistance. Unlike other safety products on the market, Wizzle is equipped with a micro GPS tracker and charged using a standard USB port. If a child is in distress, they could blow the whistle to trigger an alert and GPS pin to their parents via a synced app. This team from Leadership and Public Service High School has competed at BPC Finals for three years in a row. Last year they won third prize and during their final year competing in the program as seniors, they won second prize. The third place prize went to team SnapCase from W.T. Clarke High School in Nassau County. Students Avani Singh, Bryanna Resende, Setphanie Papoutsakis and Joe Collica pitched their business idea for a unique, economical eco-friendly and trendy alternative to a typical smartphone case. Instead of sticking with one design or material for a phone case, SnapCase would allow customers to easily pick and choose from a variety of designs, materials and accessories for their phone case – three interchangeable pieces that seamlessly snap together. Each team member received cash prizes of $750. The Final round panel of VIP judges included: Gregg Bishop, Commissioner, NYC Small Business Services; Matt Conlin, President, Fluent; Scott Gerber, Founder & CEO, CommunityCo. and Founder, Young Entrepreneur Council; Scott Jordan, Managing Director, NY Sales, Delta Air Lines; and Kim Kaupe, Cofounder, ZinePak. 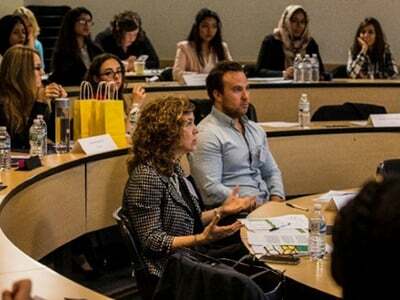 Guest speakers included Michael Portegello, Partner, EY LLP and G. Chris Andersen, Founding Partner, G.C. Andersen Partners, LLC and Vice Chair, JA New York Board of Directors.